Hot on the heels of our credit for Kanye West, comes another loops pack – Realstrings Volume 4: hip hop. A collection of 83, 2-bar loops (full and stripped down mixes), plus 72 phrases, at tempos from 75 – 100 bpm. The material reflects how strings are typically used in hip hop, featuring minor and modal harmony, staccato rhythms and stabs, musical influences from disco, world and classical, dark as well as dynamic moods, and gritty performance. The pack is available from Loopmasters. This video looks inside the pack, and explores what strings bring to hip hop. Sometimes, you can land yourself a great credit! 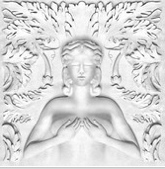 We supplied strings for the Kanye West and R.Kelly track To The World, on the G.O.O.D Music compilation Cruel Summer, which is currently #1 in the Billboard Hip-Hop chart. The strings arranger/producer was Ken Lewis, (who has a credit list to die for) and we recorded about half a dozen 4 bar phrases, including some pretty bizarre pizzicatos. Strings feature over the last minute of the track, edited here.